In many surveys over the past seven years, the Pew Internet & American Life Project has found that internet users with home broadband access are more engaged with the online world. The “always on” internet becomes an information and communications source that people rely on for staying in touch with friends and family and finding out what is going on in their communities (Horrigan 2009). Among Latinos who went online from home, 76% did so using a broadband connection. This share was up significantly from 2006, when 63% of Latino home internet users had a broadband connection. White and African American home internet users experienced similar steep increases in broadband access. In 2006, 65% of white home internet users had a high-speed connection, while in 2008 this number rose to 82%. 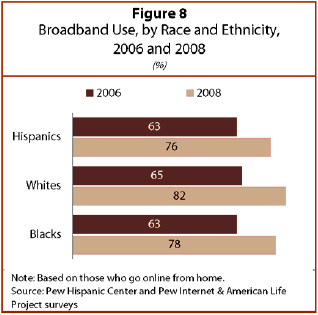 For blacks with home internet access, 63% had a broadband connection in 2006, and in 2008, 78% had one. Once again, education and income figure prominently in the use of broadband. Among Latinos who lacked a high school degree, 62% of home internet users had broadband access. In comparison, this share rose to 78% for Latinos with a high school degree. For those Latinos who were college graduates, some 86% of home internet users had a broadband connection. The same pattern emerges when looking at annual household income. While about seven-in-ten (71%) Latino home internet users in households earning less than $30,000 annually had a broadband connection in 2008, this share rose to 79% for Latinos in households with incomes of $30,000 to $49,999. Among Latino home internet users in households with annual incomes of $50,000 or more, 85% had a broadband connection in 2008. Looking specifically at Latinos who went online from home, the native born were more likely than those born outside the U.S. to have used a broadband connection in 2008 (83% vs. 68%). This pattern persists even controlling for nativity differences in educational attainment, household income, English proficiency, and homeownership. There were no significant differences in broadband access among Latino home users based upon age or homeownership status.